Every year since 1957, the Good Design Award (aka "G Mark") has been awarded to a standout Japanese product. The award marks excellence in Japanese design. A committee of sixty designers is given in a broad category of products that enter in the selection process, whether that be home electronics, apartment buildings or apparel. Today, let's look at some awesome Japanese-designed socks. They're called "Kutsu-Kutsushita" or "Shoes Socks". Made by Sunayama Socks, these socks were awarded the G Mark back in 2009. They were inspired by the Japanese tradition of removing your shoes when entering a house. 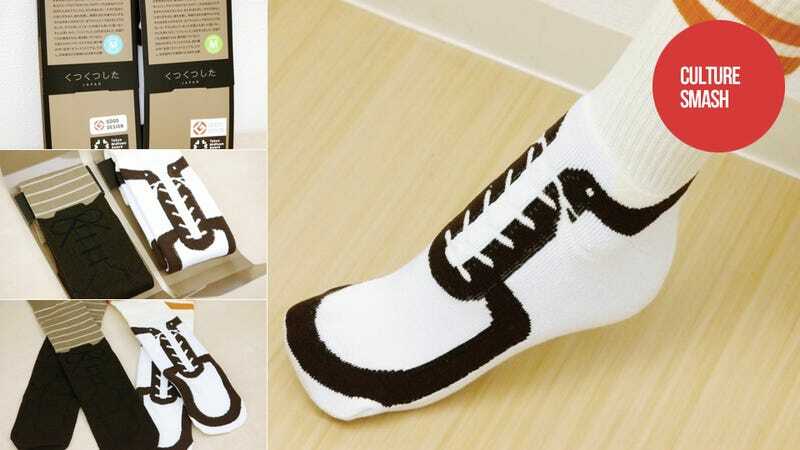 These playful socks allow Japanese people to keep wearing "shoes" while they are in their stocking feet inside. From the socks' official site: "Imagine how good it feels without shoes, pretending 'with' shoes, on the airplane, at home, at the office, or wherever you are." Like many Good Design Award winners, the product packaging proudly has the G Mark, often as an effort to drum up sales. The original Xbox 360, whose outer shell was designed by a Japanese studio, also won a Good Design Award (and we know how that turned out). "Imagine how good it feels without shoes, pretending 'with' shoes, on the airplane, at home, at the office, or wherever you are." Since people do take off their shoes indoors, careful attention is paid to socks in Japan. Before moving to Japan, I'd often try to squeeze some extra life out of socks that started to wear thin or have holes. Not here—little kids are especially quick to point out holes in socks. Thus, since so much time is spent in socks, having ratty socks is embarrassing. In America, socks didn't matter as much (shoes did! ), because nobody saw them. In Japan, people see your socks all the time, so having holes in them is a bit like wearing a white shirt covered with ketchup. Of course, not all Japanese socks are stylish or interesting like these. And American socks have made quite the impact on Japanese feet. Those infamous "loose socks" worn by Japanese schoolgirls in the 1990s? Those were E.G. Smith, American designed and produced socks re-appropriated by Japanese schoolgirls. The Sunayama designs available are "Campus" and "Midtown", and while they did have the jump on many of the more recent "shoes-socks", they do bring memories of the recent, official Portal 2 knee socks screaming back. And that's not necessarily a bad thing. To learn more about the Good Design Awards, check out the official site. For more photos, check out Gigazine.